We provide quality reproductive health care in an environment where no one is judged for their choices. We are here to support you in making the right decision for yourself and your future. We believe the world is a better place when everyone is given the freedom to make their own decisions regarding their bodies, reproductive options and sexuality. We believe it is good for families and for society when people can decide for themselves whether and when to have children. We are here for you. You can be confident that our fully trained professional staff will provide you with care that is medically safe and emotionally supportive. Our physicians and certified registered nurse anesthetists and nurse practitioner are all board certified. Our counseling staff includes bilingual health care advocates who are available to you before, during and after your procedure. If you are undecided or ambivalent about your pregnancy, we can explore all of your pregnancy options and provide resources if you choose adoption or parenting. In January, 2012, we moved to a large newly remodeled facility conveniently located in an industrial park. We have a large private parking area immediately adjacent to our entrance. We have the best in modern medical equipment. We are in the Lehigh Valley. We provide abortion care to people hoping to find an abortion clinic in Berks, Bucks, Carbon, Lackawanna, Lehigh, Luzerne, Monroe, Montgomery, Northampton, Schuylkill Counties, and beyond. Tour our clinic. We usually have volunteer monitors on Saturday mornings. They have faithfully supported us over the years by keeping a watchful eye on the protestors who are occasionally present at the entrance to our secluded parking lot for a couple of hours at that time. If you see anyone at one of the entrances to our parking lot trying to get your attention, it is not a volunteer or staff person. Drive right past them into our parking lot. 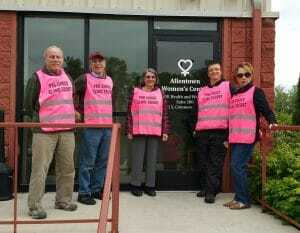 If you see someone in a bright pink vest well inside our parking lot, it is a friendly volunteer who will answer questions if asked, and who can guide you to our entrance in Suite 100. We are mentors to the next generation of abortion providers. We train medical students and residents from area hospitals. We also welcome nurses, nursing students, medical assistants, and other professionals who are interested in increasing their understanding of abortion services to observe here. Some of our staff first came to us as students, interns or volunteers and valued the works so much they came back as professionals. To our earliest public supporter when we opened and later longtime counselor Lois Slutter for her activism and service on behalf of abortion patients. To our director and founder, Sylvia ‘Rusty’ Stengle, for championing the reproductive rights of women and their families for two decades, since before the Roe v. Wade decision legalizing abortion. To our Executive Director and founder, Sylvia ‘Rusty’ Stengle for political action and community education about reproductive rights. For the person or persons who challenge the stigma of abortion in everyday practice. To the Allentown Women’s Center for commitment and direct services promoting the health and welfare of the LBT (Lesbian, Bi-sexual, and Transgender) community. To Our Executive Director from 1998-2011, Jennifer Boulanger, for standing firm in dedication and bravery, providing abortion services despite persecution from anti-choice groups. 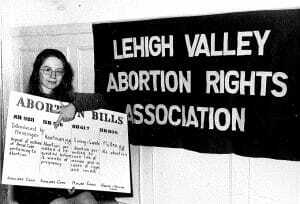 1978: We provide our first abortion services, to four patients, after three months of remodeling a space on the corner of Highway 22 and Airport Road in Allentown. We are the first and still the only independent abortion clinic in northeastern Pennsylvania, serving a 20 county region and nearby New Jersey. 1979: We are closed down capriciously by the local zoning board, which is being hounded by anti-abortion activists, under threat of high fines. We fought, successfully, to re-open our doors though a court order. 1981: We added other gynecology care to our abortion services, hiring a physician’s assistant, and expanding the range of our services. 1984: We did self-defense training for the staff because there were some clinic invasions by abortion protesters in nearby Philadelphia. We never needed to use the training, but we are very empowered by our new self-defense skills and readiness for problems that don’t materialize. 1984: PA Medical Assistance stops reimbursing for abortion. We did a before-and-after survey showing the devastating effects of this on poverty level individual’s ability to control their reproductive health. We did what we could afford to do to provide sliding fees for those in need…We are appalled at what a short-sighted and cruel policy decision has been made. 1985: We initiated general anesthesia for abortions, providing for the first time the opportunity to be asleep for an abortion procedure in our out-patient setting. We were very cautious; we did a great deal of research into safety, and a great deal of staff education. It turns out that complications from anesthesia, properly administered, are very, very rare. 1986: We acquired our first ultrasound machine and begin using it to do pregnancy sizing to determine gestational age more accurately than is possible with a manual pelvic examination. We now use it routinely during abortion procedures as well as for gestational sizing, which makes the procedure much safer than was possible without its use. 1992: We are proud to be one of five abortion clinics that fought restrictions on individuals by being plaintiffs in the Planned Parenthood v. Casey Supreme Court Case. To our dismay, the court decided to require a 24-hour waiting period before a person could obtain abortions and also that teens had to have parental consent or else go through a judicial by-pass process. 2002: We begun providing medical abortions in addition to surgical abortions. 2002: Our building was part of a larger property that was sold to a developer, causing us to move to a site on Union Boulevard in Allentown. As time went along, protester activity increased at this site. 2012: We protected our patients and staff by moving to a secluded site in the Lehigh Valley Industrial Park in Bethlehem. It has a convenient location and a large private parking lot, along with expanded newly remodeled space equipped with the best in modern medical equipment. We are licensed, inspected annually, and approved by the Pennsylvania Department of Health’s Division of Acute and Ambulatory Care. We are in full compliance and each year renew the Department of Health and Human Services CLIA Laboratory Certificate of Compliance. We are members of Pennsylvanians for Choice. We are members of the National Abortion Federation. We are affiliated with the Abortion Conversation Project, Inc.